Tony La Russa is described as many things. An overcompetitive control freak. Frighteningly intense. Self-aggrandizingly overactive. Insane. But the one thing you never see him described as is "old." He is old, you know. He turned 67 earlier this month, which makes him the third oldest manager in baseball, behind Washington's Davey Johnson, who just came back after being retired for eleven years, and Philadelphia's Charlie Manuel. He's older than Tom Coughlin, and Bill Clinton, and Tommy Lee Jones. Now, you can be old and still manage baseball; Casey Stengel won his final championship with the Yankees at the age of 68. Of course, two years later, the Yankees fired him, as Stengel put it, "for turning 70. I'll never make that mistake again." La Russa might try to hide it — poorly — with that hair, but he is an older man. For the first time I can remember, he really looked it last night. The Cardinals lost 4-2 to the Rangers in Game Five of the World Series last night, in as demoralizing a fashion as you could possibly imagine. I know that the Cardinals have been (rightly) celebrated for their crazy comeback to win the Wild Card in September, from ten and a half back in late August, but it's worth remembering that there was a reason (several reasons, actually) the Cardinals were ten and a half games back in the first place. This team has always had talent, but mostly this year that talent was used to squander opportunities. The blown saves — the most in baseball — are the standout stat, but the Cardinals also hit into more double plays this year (169!) than any team in National League history. This is not the worst stat imaginable; you have to be pretty good to get enough guys on base to hit into that many double plays. But it was indicative of just how frustrating the Cardinals were until their late-season run: No matter how many doors were opened for the Cardinals, they'd always find a way to trip on their walk through them. Last night brought all that back. The Cardinals were one-for-twelve with runners in scoring position last night, and even that stat doesn't do it justice, considering how many base-runners and bunters lost, to the hinterlands, apparently. The last person ever to be caught stealing twice in one World Series game was Billy Martin, in 1956. Last night, Allen Craig — who bats before Albert freaking Pujols — matched that "feat." Last night was one missed opportunity after another, just like the pre-September Cardinals fans had been painfully watching all season; the Cardinals were ahead almost the whole game, but they always fell behind. This was driving me and everyone else at Foley's — the official NYC bar for Cardinals fans — batshit, but it appears to have caused LaRussa to have had multiple aneurysms. Because he really lost it at the end. To make La Russa's story make sense, I have to believe, more or less, that the Cardinals' bullpen is staffed by the people who couldn't make the cut at the DMV. They had to mis-hear two phone calls, including getting two completely disparate names mixed up on the second. They had to show no concern that their matchup-happy manager had no right-hander throwing behind the left-hander coming in, despite the presence of a great right-handed batter in the on-deck circle. And they had to warm up a pitcher who was, at the start of the night, deemed unavailable to pitch, and do so without questioning the instruction. ... I'm not there. If someone wants to present evidence that the staff in the Cardinals' bullpen did all this, I'm all ears. Because if it's me, and the manager says, "Get Lynn up," I take three seconds to say, "Lynn? Thought he was shut down?" Maybe that conversation didn't happen, and then it's worth exploring the minds of the guys on that end of the line. Until such time, however, I'm going with the simpler explanation that doesn't require a whole bunch of people to be morons: La Russa screwed up the biggest decisions of the night. Really, my head hurts trying to figure out what La Russa did to this game but mostly how he tried to explain it away. It was like being stuck in a gigantic corn maze. Blindfolded. At midnight. After getting spun around 38 times. Every explanation led to another turn that led to another dead end or false exit. The bottom line is he lost the game having a matchup he didn't want — a left-hander pitching to red-hot Napoli — and he lost his last opportunity by getting a runner thrown out who, while down two runs, didn't mean anything. I've never seen a game even close to this one and I hope never again to have to try to explain one like it. And that's what was most distressing about last night. This wasn't an example of Tony overmanaging, or at least not a particularly egregious one. This was simply a matter of Tony getting lost, the way an old man gets lost when he wakes up in the middle of the night when all the lights are off. This was a Tony I had not seen before: confused Tony. Like this was all too much for him. 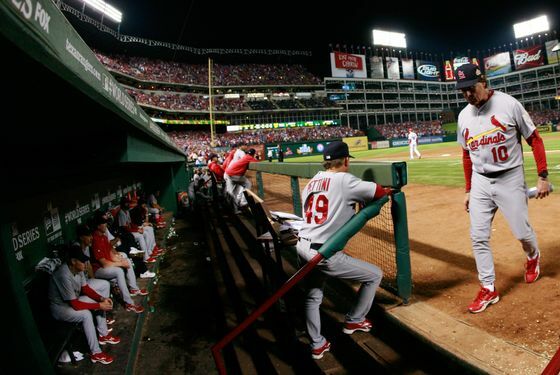 As infuriating as some of La Russa's decisions have been over the last sixteen years, I've always liked having the guy as Cardinals manager, because I always knew he was on top of things, that even when he made a mistake, it was because he was on top of it, because he was too involved with the game to step back and stay out of the way. But that's not what happened last night. Last night Tony just lost track of what was happening. Last night, Tony just couldn't handle it. That is an amazing thing to say, or even think. This is Tony La Russa. But this is what happened. There is no other explanation: Tony just lost it last night. And now the Cardinals are one game away from elimination, after a game that they not only should have won, but won easily. The series comes back to St. Louis for Game Six tomorrow, and Busch Stadium will be rocking. This isn't over. But I really hope someone gets Tony a nap, and maybe some pudding. The man, for the first time, looks elderly. That might be the scariest aspect of last night's loss.